Uneven Ground, Shedd, Puppeteer, Royal Jackets, Troubled Frank, the Flaming Tea Bags. All proceeds go to the Jethro Morrow Health Trust. Black Frog Event & Artist Management first heard about Jethro in 2011 after a year of looking for a charity to run annual events for. Fundraiser events are an integral part of Black Frog as the first few shows Black Frog ran were fundraisers. The first being for Save The Children and their work in Haiti where $700 was raised after an event was organised in three weeks on Feb 10th 2010. Jethro Morrow (aka Gantely) was born in 2010 and at 8months old was rushed to Starship Hospital. It was here that he was diagnosed with one of the rarest genetic illnesses aHUS or ATypical Hemolitic Uremic Syndrome. This means that his kidneys, liver and/or heart could give up at any moment without any warning. Jethro is the only child in NZ and only one of three children in Australasia with aHUS. The only known medication/treatment is Soliris which is also one of the worlds most expensive drugs costing $500,000 a year! This drug is currently not funded in New Zealand, New Zealand is also one of the only countries in the world where the drug is not funded and Jethro has been denied funding twice from Pharmac. 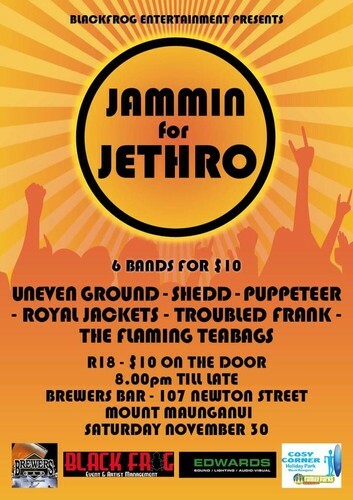 The Jammin' for Jethro events are Rock and Metal based with 100% of the profit raised going directly to the Jethro Morrow Health Trust. * The SWIFT code belongs to Citibank New Zealand, which accepts payments on behalf of Kiwibank.